Sally and her family moved to Brunswick County in January 2004 from a West suburb of Chicago, Illinois. She has two daughters who also live in southeastern Brunswick County, along with three grandchildren. Sally and her husband had always dreamed about retiring to North Carolina, they decided that they couldn't wait any longer. Sally got her Real Estate licenses right away and has been a broker ever since. "I would definitely refer Sally to a friend, and I plan to do so. Sally was very responsive when we asked her to show us particular houses! Sally was very professional, and treated us with respect." "Sally was an instrumental agent in the purchase of our new vacation home. Working with her was such a delight. She was fast acting and ensured that all of our negotiations were addressed in a professional manner. She is very knowledgeable about the area and helped us with all of our concerns. I highly recommend Sally to be your agent for the purchase of your dream vacation home." 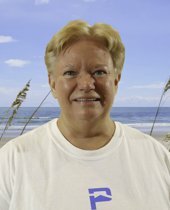 "Sally's friendly nature and expertise helped make our home selling experience a success! She answered our questions quickly and gave us honest advice. All which resulted in the sale of our home! Thank You Sally!" "Sally worked with my wife and I to sell our home in Supply, NC, while we were living out of town. Sally was excellent in every regard from the beginning to the end of the process. She listened to us carefully, gave us a range of options, and told us where to price our home to sell it quickly. We took her advice and had multiple offers above our asking price within the first week! We ended up accepting an offer that exceeded our asking price! Sally was also an invaluable resource with us being out of town. She worked hard, was prompt with correspondence, and was very thorough with details. She was happy to oversee some of the repair work we needed, and she was an excellent liaison throughout the entire process, from contract to close. Perhaps the most remarkable thing is that, because she is with Help-U-Sell, her fixed commissions are lower than other, percentage based agents! She provided excellent, expert, full-service real estate representation, and at a discount to boot! I honestly can't imagine a better and smoother experience selling a home, and I can't recommend Sally enough. We would definitely use her again!"